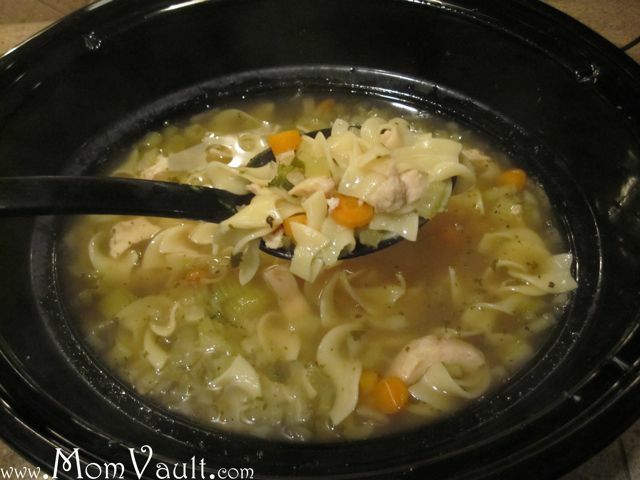 This is my own recipe for Chicken Noodle Soup. By the end of the week if we haven't been able to eat all the celery and carrots in the refrigerator I tend to make a soup so the vegetables don't go to waste and we get dinner for a few nights at the same time! Defrost 3-4 large boneless, skinless chicken breasts (or use fresh). While those defrost grab the carrots, celery, onion, and cilantro and cut to your preferable size. The last few times I made this I cut the veggies too small so this time I went large chunks! Pour the Chicken Broth and water into crock-pot along with the seasonings, followed by the veggies. Turn on the crock-pot and set for 6 or 8 hours. Cut the raw chicken breast into cubes and add it to the crock-pot. About an hour before the soup is to be eaten add a minimum of 3 cups of noodles. My recommendation is to eat this soup with toasted sourdough bread and butter!